John Deere and Husqvarna are two of the largest brands of lawn mower and tractor manufacturers, and both have widespread networks of retail dealers across the country, as well as retail arrangements with several major home improvement stores. While John Deere and Husqvarna offer many of the same features on their push lawn mower models, Husqvarna offers a much wider selection of push mowers with several self-propelled mower models, several manual mowers and a hovering trimmer, as opposed to just a few push mowers from John Deere. All John Deere lawn mower models come equipped with a Briggs and Stratton engine, while Husqvarna uses Briggs and Stratton for most models, but Honda for a few of the self-propelled push mowers. Husqvarna and John Deere both also include an electric ignition option for starting the engine on one of their self-propelled lawn mower models. In addition to several motor-operated lawn mowers, Husqvarna also sells several free-shear operated manual mowers. Both John Deere and Husqvarna feature 3-in-1 discharge systems for their lawn mower models, which allow homeowners to choose to mulch, bag or side discharge the grass clippings when mowing. 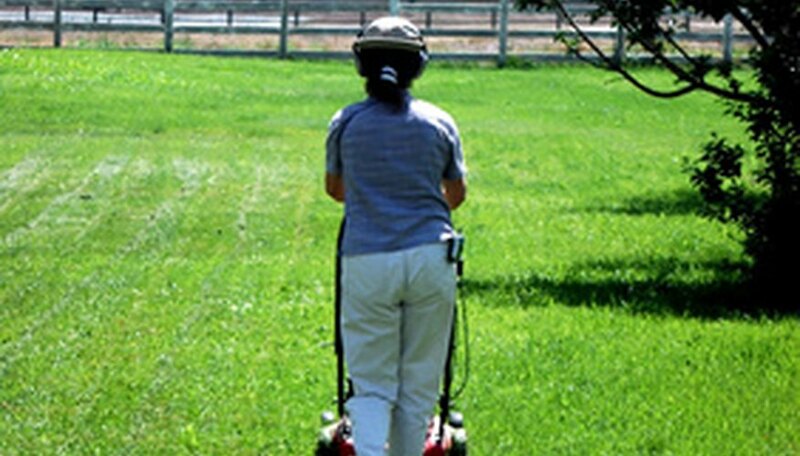 The 3-in-1 discharge is an option for all of the motor-driven mowers, although Husqvarna also sells manual mowers that only discharge the clippings. John Deere uses a self-propelled drive for all its lawn mower models, and Husqvarna uses a self-propelled drive for all but one of its motor-driven mowers. Both John Deere and Husqvarna offer some front-wheel and some rear-wheel drive models. Husqvarna also makes a hovering trimmer that operates using an air impeller, designed for navigating hard-to-mow spaces. All of John Deere’s lawn mowers feature a 22-inch cutting deck, while Husqvarna offers only one 22-inch lawn mower. The rest of Husqvarna’s self-propelled mowers, including the hovering trimmer, are 21 inches, and the manual mowers are 16 inches across. All Husqvarna lawn mower models are covered by a 2-year homeowner warranty, and the hovering trimmer includes an additional 1-year commercial warranty. John Deere also provides a 2-year warranty for all lawn mowers. Both Husqvarna and John Deere have specialty brand-name dealers across the county that specialize in offering their products for retail. Additionally, Husqvarna lawn mowers are sold at Sears and Lowes, and John Deere mowers are sold at Home Depot and Lowes.